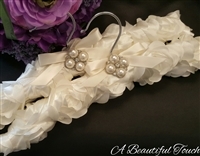 Mom and I made all our Wedding gown hangers in our Westmont, NJ boutique. 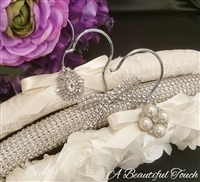 Our styles and selections change so please visit us or call us at 856-858-3777 for more information. 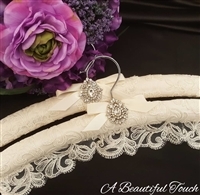 Top hanger is $45 and the bottom lace hanger with scalloped edge is $69. Ivory Lace with Sequins & Beaded Applique - Back in stock soon!